HJC already offers a Deadpool design helmet, an IS-17. 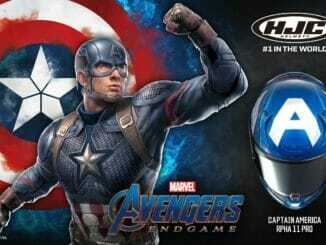 Now they announce another helmet in the design of the anti-hero. On the occasion of the 30th anniversary of the Superbike World Championship, “The World According to Foggy” will tell the stories of legend Carl Fogarty. Büse has a new leather suit in the program. Dunlop has developed a successor to the Trailsmart which gets the addition Max. In March 2018, Dunlop launches the new Sportsmart TT sports tire. Helmet manufacturer SCHUBERTH and manufacturer of motorcycle clothing, the company Held, deepen their cooperation. Not only look to Wunderlich’s latest variation of the R NINET scrambler differs from the original. The BMW Motorrad accessories specialists gave the “Green Hell” christened model also some technical highlights.